Well the time has come, and Doug is now the proud(?) owner of a 2007 Aston Martin V8 Vantage! So what should he do with it over the coming year? Below I have a few ideas, ranging from obvious, to possibly insane. 1. Track Day, bro. 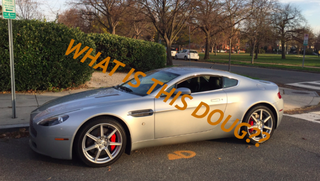 Obviously we all want to see Doug race around a track in his Vantage. No further explanation needed. 2. Take it to a Ford Dealership for an appraisal. 3. Post a video of you reading through the entire warranty in your best British impression. 5. Somehow round up his previous vehicles for a reunion. 5. BOND BOND BOND. James Bond, that is. 6. Attend Oppo meet 2016 so we can all mock him in person! 7. Put Torch in it for a Jason Drives episode. 8. Instead of having a dealer work on it, have the good lads from over at The Garage do all of his maintenance. Those jeeps turned out well, right?! 8. Join Uber for a day, wear a tux, and film people’s reaction as you pick them up. 8. Meet up with Freddy and see examples of what you could have bought! 9. Enter formula drift, yo. For a day. Or until death do him part. 10. Sell it and but a fleet of Prii and CrossCabs. Anything you have to add that you want Douglas to see? Add it below!